Introducing the Infinity Series luxury pontoon, the Lowe pontoon boat that raises the bar for craftsmanship, performance and style. 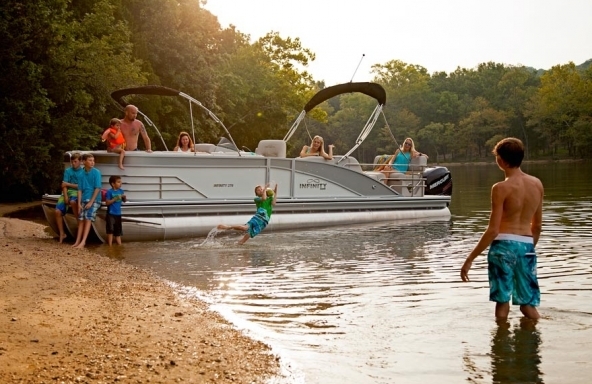 Infinity offers the boldest vision of what pontooning can be and brings that vision to life with the perfect blend of on-water comfort and fun. Sink into supple pillow top upholstery, take control at the handsome chrome accented helm, or have the thrill of a lifetime being towed by a powerful, system-matched outboard. The invitation beckons: Come and enjoy the well-lived life! Explore your options by choosing an Infinity Series model below. 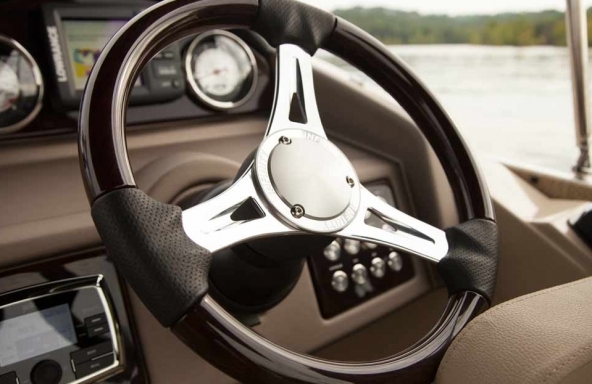 Besides being the sharpest looking pontoon on the water, the captain of an Infinity pontoon enjoys the best view behind the premium console featuring stylish accents, 4:1 anti-feedback steering, and a soft grip wheel. 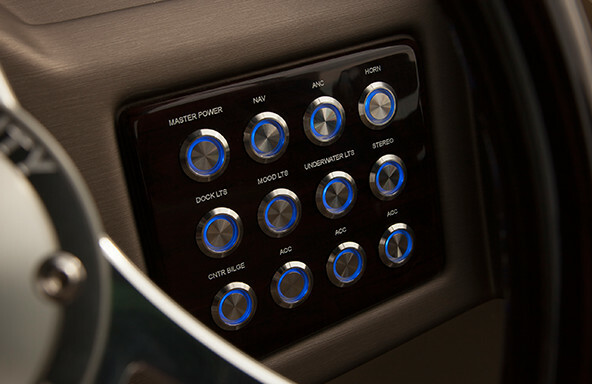 Control all aspects of your on-water-experience with the simple and dazzling push button switch panel. Sit back. Relax. 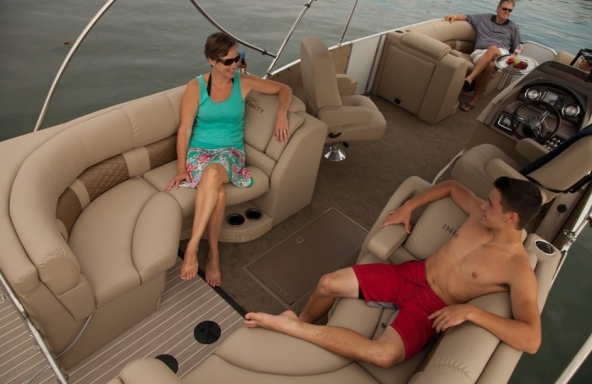 Lowe Infinity pontoons premium furniture raises the bar for both style, extreme durability, and unrivaled comfort on the water. With seating of up to 14 passengers on 270 models, celebrate freedom in style on the ultimate pontoon party boat. 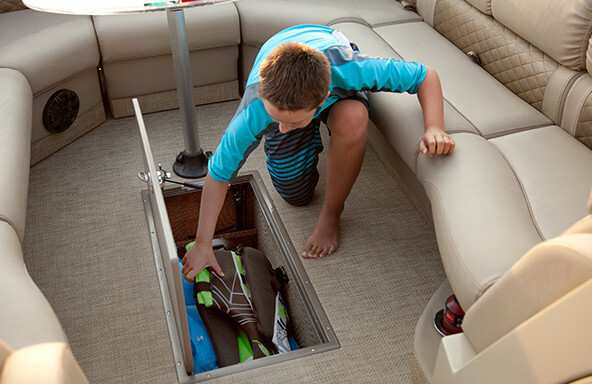 Stow whatever you need for your next adventure with confidence in the optional lockable in-floor gear storage compartment. 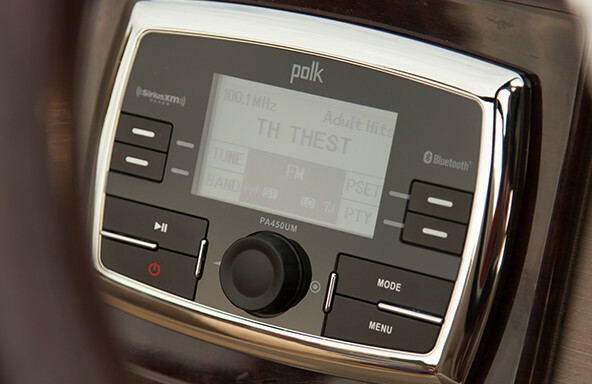 A high performance Polk AM/FM marine stereo with bluetooth connectivity and six built in speakers is standard on all Lowe Infinity pontoons. 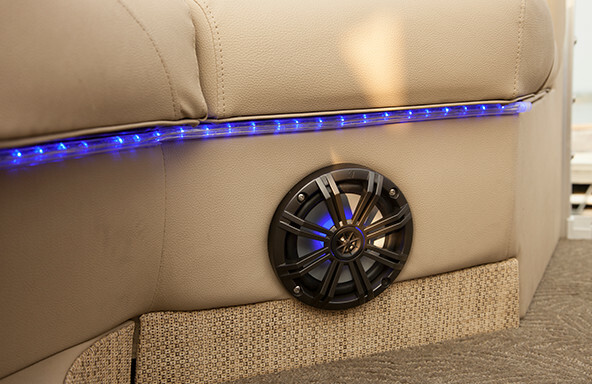 The built in Polk marine-grade speakers saturate with crystal clear audio that is sure to impress the most discerning audiophile, compliment the music with the optional LED lighting package. 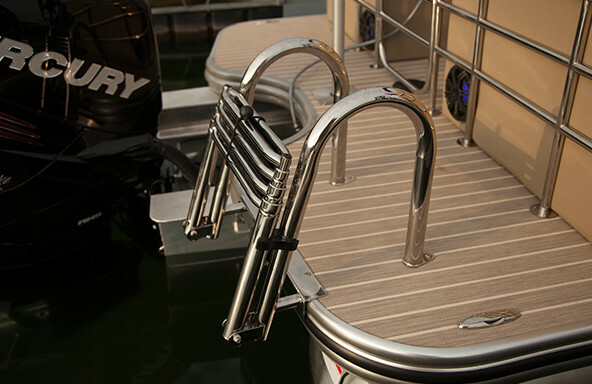 Climbing out of the water has never been easier with the heavy duty, ultra-sleek telescoping 4-step stern boarding ladder.